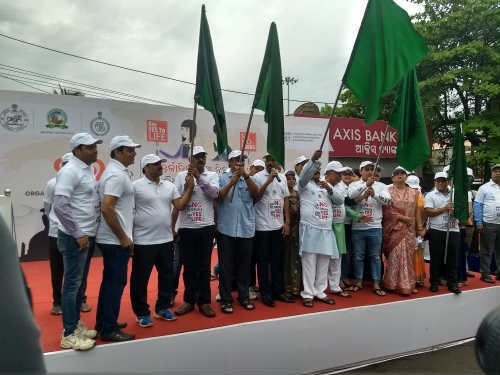 Bhubaneswar: Defying an early morning shower, hundreds of participants today took part in a rally on the occasion of International Day against Drug Abuse and Illicit Trafficking from BMC Office to Master Canteen Square. Women and Child Development, MSME and SSEPD Minister Prafulla Samal in his speech requested the youth to adopt better lifestyle practices so that they would be away from drugs, always. “Supported each year by individuals, communities and various organizations all over the world, this global observance aims to raise awareness of the major problem that illicit drugs represent to society,’’’ he added. Saying about the theme of this year’s event “Listen First’’ the veteran actor said “Listen First – Listening to children and youth is the first step to help them grow healthy and safe” is an initiative to increase support for prevention of drug use that is based on science and is thus an effective investment in the well-being of children and youth, their families and their communities should be the focus. Principal Secretary Excise Department Nikunja Bihari Dhal in his speech said that the youth and young citizens should be exposed to more and more awareness activities so that they could imagine the ill effects of taking the banned substances and the society could be saved.